I have mentioned before that our local bike shop is Everybody Bikes. This place belongs in our San Francisco destinations because we are there so often we have started to feel like stalkers. We’ll love you even if you get that restraining order, Everybody Bikes! However my son, who can be very literal, finds their name inappropriate. Our initial visit to Everybody Bikes came at the strenuous urging of my brother-in-law, who had bought his commuter there a few months earlier, when they opened. Unlike us, he knows a lot about bikes, and he was very impressed with their work. On first impression, we were not as infatuated. When we walked in the door, we immediately noticed that they primarily stocked mountain bikes (this has changed). They did not have child seats. Moreover, the hipster vibe was very strong. The shop’s owners wore the kind of tight pants that always make me want to check for gangrenous toes, accessorized with heavy black plastic glasses, knit skullcaps, and Rorschach facial hair. As a parent these visual cues make me twitchy. These looked to be the kind of people who screamed “Breeder!” at moms in minivans during Critical Mass rides. What’s more, on our first visit they weren’t too familiar with children. 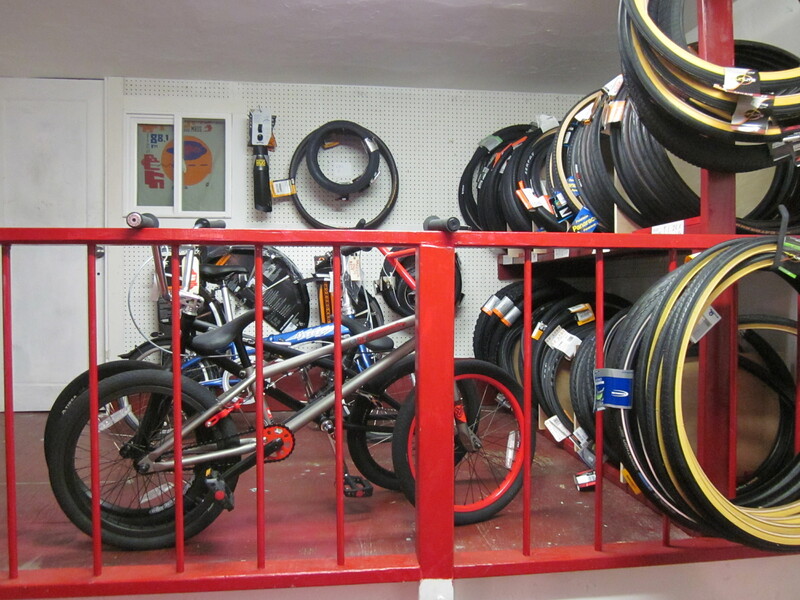 We usually bring toys for our kids when we are stopping in a store, but this is hopeless in a bike shop: no toy in our possession compares to bike accessories. 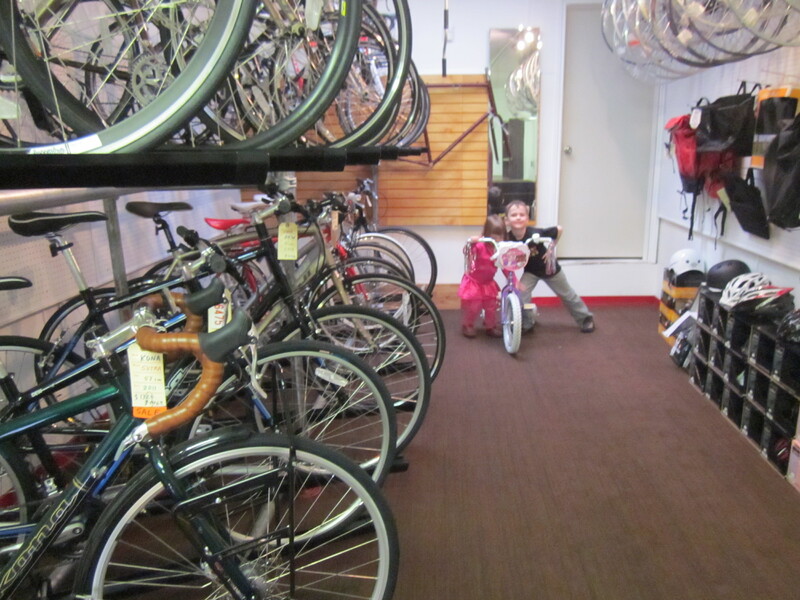 Our kids bolted for the bike bells and pumps (we figured they could do little damage in this section of the store); one of the owners visibly flinched and asked us to please get them to play somewhere else. This was tough to do; the store is roughly the size of a suburban walk-in closet. Since then, we have all gotten to know each other a little better. Despite our initial reservations (and, evidently, theirs) we’ve realized we’re fortunate to have a shop like this within walking distance. When we lived in Berkeley, our apartment was down the street from an independent hardware store legendary for its service. When I came in to buy nails one day, I saw one of the owners signing tentatively with a deaf customer. When she left, I commented that I didn’t know he knew how to sign. Oh, I just started taking a class because she moved into the neighborhood, he said. 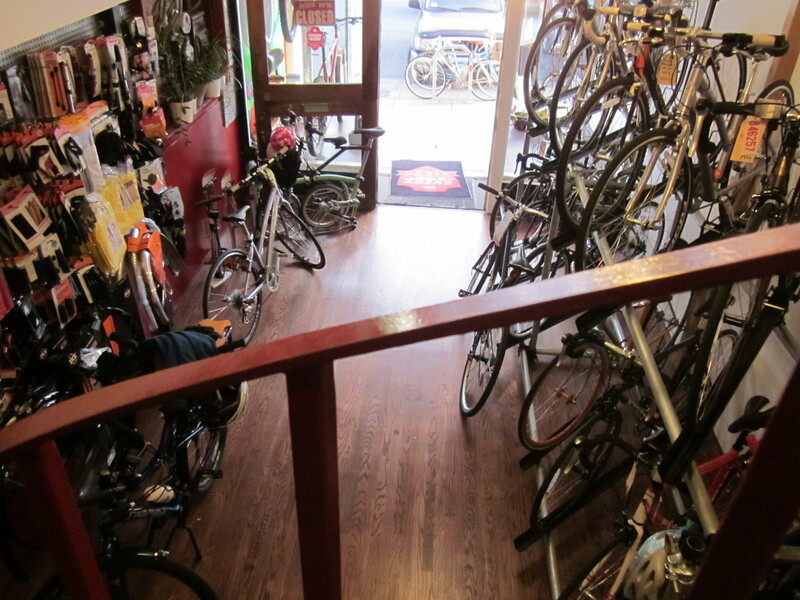 Everybody Bikes is like that hardware store. What they don’t know, they’re ready to learn. And although this is changing, family biking has a fairly steep learning curve. They’ve been game to help us figure it out. Our kids made the shop owners nervous at first, but they have gotten more comfortable with families. They carry a couple of balance bikes and children’s bikes, and from day one they were able to fit a kid’s helmet. They are good-natured about our daughter’s efforts to pump air into the hole in the sidewalk at their front door, and endlessly concerned that both kids not injure themselves on the store’s spiral staircase or on our bikes. This is a hopeless cause in the case of our daughter, but we all make an effort. They have learned that kids need frequent bathroom visits and always volunteer theirs. Like Trader Joe’s, they offer stickers, and we have probably a hundred “Everybody Bikes” stickers now in various corners and drawers. I see other families in the shop now, and this attention isn’t unique to us. The owners might look like hipsters, but they don’t act like them. They take the shop’s Kona Ute to the farmer’s market and to street fairs and give free bike tune-ups. They offer a bicycle maintenance class, which Matt is taking this year. They open the store for neighborhood movie nights and art shows (okay, this is kind of hipster-esque). When we talk to the owners at the door, neighbors walk by and greet them by name. We’re not the only people around here who like them. They stock more commuter bikes now, and a month ago I watched a family walk in and order a Linus from them that they planned to rig up with child seats. I’ll admit that I still wish they actually stocked child seats, but they’ll order and install them. 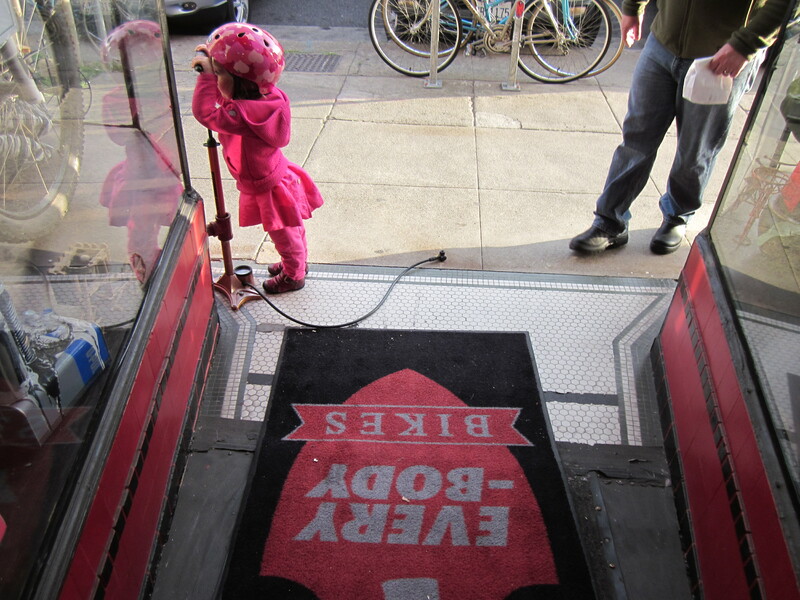 The Sunset is one of the few places where families are relatively thick on the ground in San Francisco, and because they aspire to be a neighborhood bike shop, they’ll work out issues that come up when riding with kids. They’d never set up a Kona MinUte to carry kids before (ours was the first MinUte they’d ever sold, and they gave us a great price), but they found really nice stoker bars for us. When the footpegs they wanted to fit on the bike were out of stock, they found and ordered an alternative on eBay. They keep adjusting the MinUte’s crappy brakes for free. San Francisco can be hard on bicycles. They keep us moving, and they are unbelievably nice. Everybody Bikes took over their location from an extremely successful and much-beloved shop, Roaring Mouse Cycles, when it moved to larger digs in the Presidio. Roaring Mouse would be a tough act for any bike shop to follow, but they have managed it with grace. 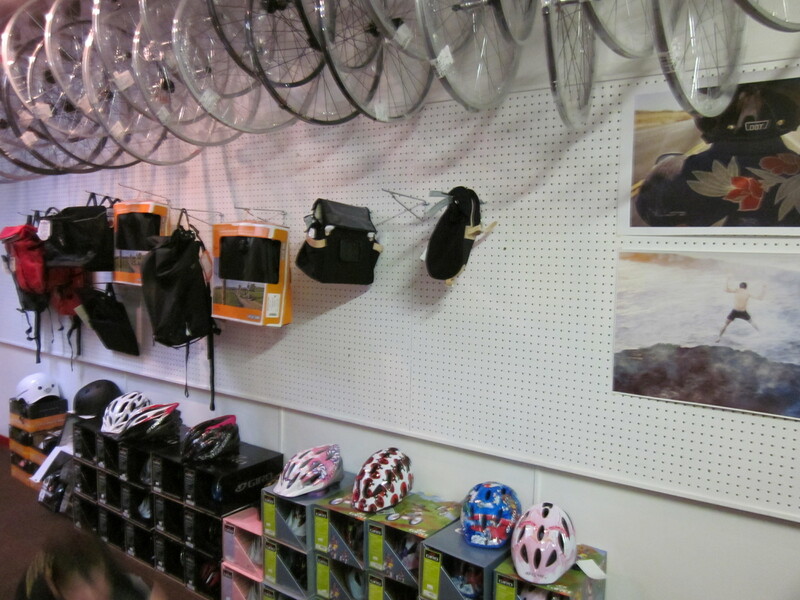 When other parents in the neighborhood ask us where we got our MinUte or where to buy a kids’ helmet, we’re always delighted to tell them to head over to Everybody Bikes, at 15th and Irving, where they’ll be treated like human beings even if they are as clueless as we were. Hello. Very awesome web site!! Guy .. Excellent .. Superb .. I will bookmark your website and consider the feeds in addition…I am pleased to locate many helpful information here inside the publish. Thank you for sharing..